I was excited to be asked to share ideas about effective social media use for young people with Student Voice. Student Voice is a student-run and non-partisan, not-for-profit organization focusing on issues such as dropout rates, student achievement, and workforce readiness. Student Voice was created as a result of the research-based belief that all these issues will be improved with student voices in the classroom and in society. In addition to their face-to-face work, Student Voice is also well-positioned to address these issues with a digital platform. 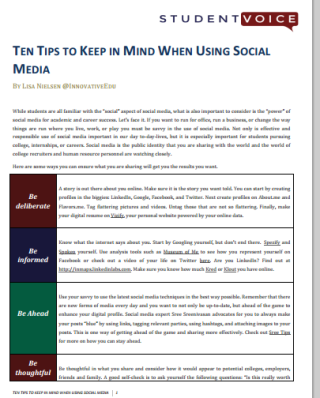 Knowing how to use social media effectively is an important part of this work. You can check out these ten tips by clicking the caption on the thumbnail below.